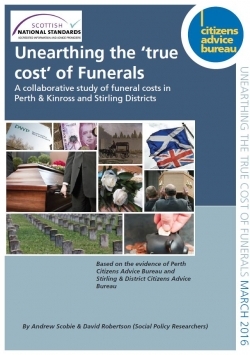 Social policy researchers from Perth and Stirling bureaux have published a report following a collaborative study of funeral costs in Perth & Kinross and Stirling Districts. The report outlines a mixed method research study which set out to explore the causes of increasing funeral costs locally, to identify weaknesses in existing protocols and support systems pertaining to funerals, and to make recommendations for change. Work on this project commenced in March 2015. CAS published research (The Cost of Saying Goodbye) which highlighted how the rising funeral costs was contributing to increasing incidents of citizens being unable to afford the most basic of funerals and ending up in ‘funeral poverty’. Whilst initially the research was to be focused on Stirling, it was decided to work jointly with Perth after it was revealed that both local authorities were in the top 5 most expensive in Scotland for burials. Moreover Perth and Kinross Council operates the most expensive local authority crematorium in Scotland (Stirling presently has no crematorium). The team decided that they would not collect data directly from bereaved citizens. Henceforth they approached funeral directors and other bereavement service providers operating in both local authorities. Micro case studies from both bureaux were used as in-house evidence. There appears to be little discretion as to who is the ‘closest relative’ to the deceased and entitled to help with costs. The team also looked into the reasons behind local authority funerals which is something that had not been done in the CAS research. Their findings regarding the growth in an inability to pay for funerals are extremely useful and will be used in future national work on funeral poverty. The report and a fact sheet produced by Stirling CAB on funeral poverty can be downloaded from the bottom of this page.